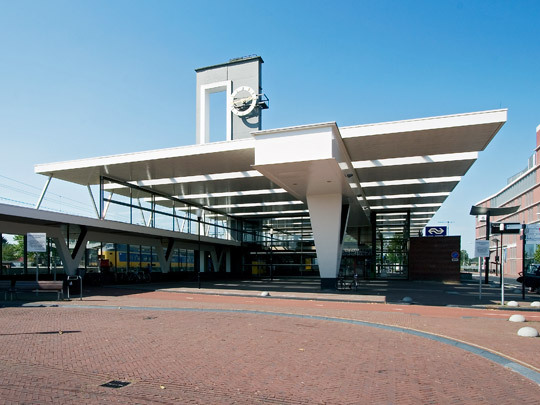 The station at Almelo is the third to stand here, the most important changes this time being a tunnel instead of a bridge and the addition of a bus station. To scale the complex to modern modes of transport, the architect chose an expressive landmark of a building. Its most conspicuous features are the huge steel joists and V-shaped columns, together with the 25 metre high tower of reinforced concrete dressed in glazed brick. Everything else about it is airy and transparent. The station exemplifies perfectly the expressiveness of post-war modernism.